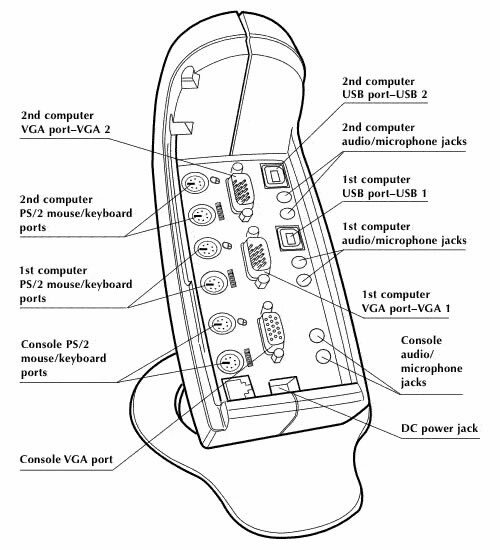 Now Belkin gives you control over four computers; either PS/2 and/or USB models, or both from a single PS/2 console. The Belkin OmniView SOHO Series 2-Port KVM Switch with Audio (F1DS102T) from Belkin gives you easy, cross-platform control when used with PC and Macintosh USB platform. The Belkin SOHO Series also adds a sharp new look to your desktop, with its vertical design that saves space while providing built-in cable management. When the shroud slides into place, the cables flow neatly through the back opening. Engineered with such advanced features as audio and microphone switching support,the Belkin SOHO Series makes controlling multiple computers easier than ever. Now you can switch between speakers and microphones without having to unplug and re-plug them. The flash feature gets you firmware updates quickly and easily through a simple serial interface. The Belkin SOHO Series also supports high-quality resolution of up to 2048x1536 @85Hz when used with coaxial VGA cabling, offering uncompromising display quality. It requires no additional power supply and standard features include hot key functionality, keyboard and PS/2 emulations, and a Belkin Five-Year Warranty. Question: need instruction manual for hook-up and how to use this item. Answer: Thank you for your inquiry. The manual is linked above in the description area for the Belkin OmniView F1DS102T or can be found directly here: Belkin OmniView F1DS102T Manual.